Tami Walker was always an artist at heart, terrorising her parents with all her attempts of ‘creativity. She was born and bred on a wildlife farm in Zimbabwe into a family whose lives revolved around the bush and wildlife. After leaving school, her passion to create art sat dormant in her for 10 years whilst she traveled and tried to take part in the rat race overseas. She returned back to Africa and began studying a degree in Applied Design, Photography being part of her degree but something she never thought she would be interested in. She fell in love with analogue photography and lived in the darkroom for the duration of her studies. 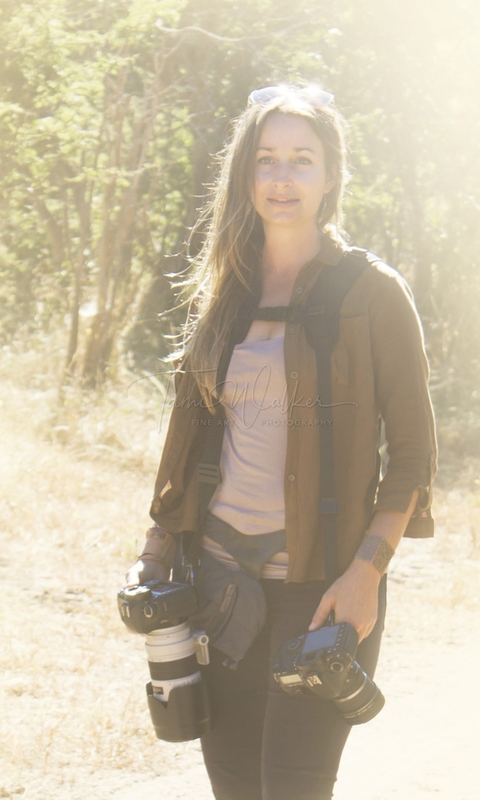 On returning back to Zimbabwe it seemed pre-ordained that she combine her two passions- wildlife and art, through the means of photography. Tami's photography is a product of passion, love and a deep admiration for this beautiful continent Africa. Her hope is for this to translate though in her images. To not document what she sees, (there are much better photographers out there for that), but to rather effectively capture Africa and translate her moments the way she see's them through her eyes.